EXPERIENCES TO BROADEN THE HORIZONS OF THE OLDER CAMPER. FOR AGES 9-15. BOYS & GIRLS ARE GROUPED BY RISING GRADE LEVEL. NEW! The Senior Camp Showdown! A week-long competition, where strength, speed, critical thinking and teamwork combine! Events include an inflatable obstacle course, the Amazing Race, Trivia Face-off, Aqua Olympics and more! A fun-filled week of team competitions! Green vs. Blue – who will be this year’s champion? ENHANCED SENIOR CAMP PROGRAMMING You’ve asked and we’ve answered… Get ready to enjoy enhanced teen programming exclusively designed for our OLDEST senior camp group (age 13-15). 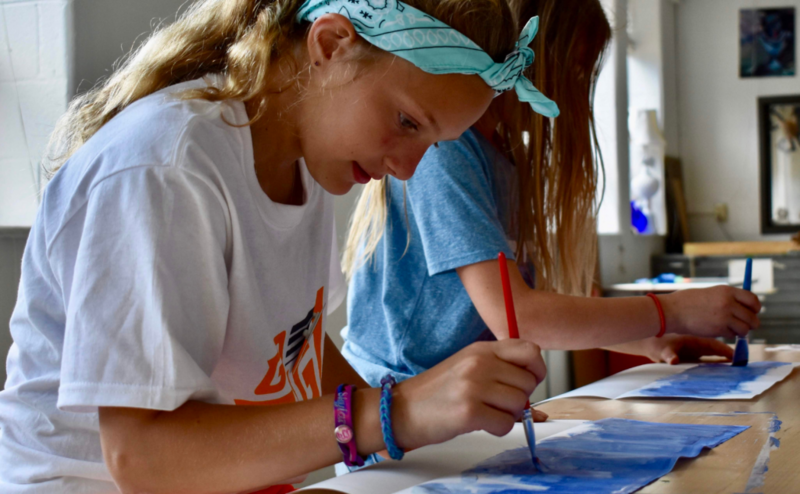 Campers will create life-long friendships while participating in all Senior Camp traditions and True Life Adventures, coupled with FUN leadership activities, community service projects, mentoring opportunities with younger campers, and project-based team challenges. A perfect blend of all the elements of camp life! 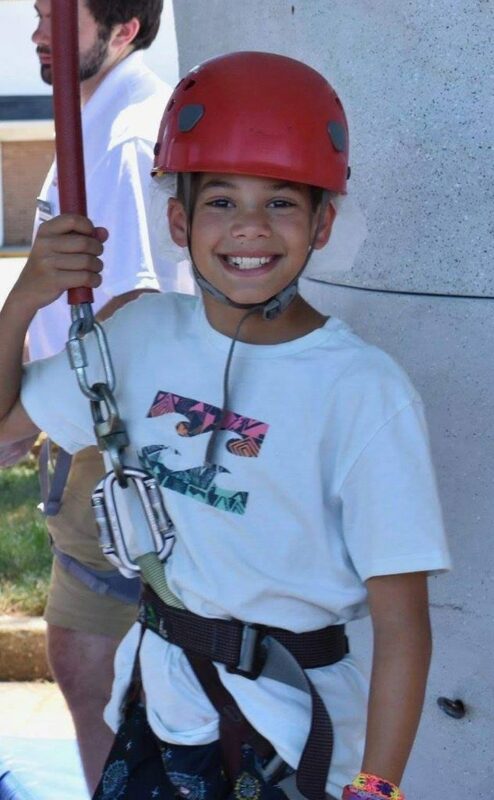 Reach new heights through innovative programs designed to broaden the horizons for our oldest campers. Fun activities include True Life Adventures, daily swimming, art, sports, team initiatives, service learning, leadership skills and much more! This exciting new TLA will keep your mind moving, spark your imagination and take teambuilding to a whole new level! Join us for a week of intrigue as you and your team use critical thinking, ingenuity, collaboration and teamwork to solve a series of puzzles, riddles and physical initiatives. Utilizing various strategies, Rube Goldberg machines and other miscellaneous materials, your objective will be to solve the carefully designed mysteries, problems or challenging puzzles of the day while keeping your mind sharp and your thinking cap on! Sign language is more than hand gestures – it’s a beautiful, visually perceived language in which facial expressions and body movements are used to communicate words, emotions, and sound. This TLA gives you the tools to interact and communicate with the world around you in a completely different way. Work with your instructors to customize your ASL experience and showcase your newly acquired language by signing a song, poem, skit and more at the end of the week. Everyone loves emoji’s – those cute and colorful symbols that communicate more than emotions! In this creative TLA, you will use digital graphics to layer emoji’s of different sizes, colors and shapes to create self-portraits, landscapes, and creative works of art. At the end of the week, print out and mat your favorite creation made from these iconic symbols to display at ESF’s first-ever Emoji Art Exhibition. One of our most-anticipated traditions in Senior Camp, you will have the opportunity to design and build a Carnival from the ground up. Learn face painting techniques and how to create balloon animals. Become proficient in juggling, clowning and sleight of hand magic tricks. Finalize your Carnival booths and practice your performance skills in preparation for the exciting Main Event hosted for Day Campers on the last day! Explore music fundamentals and enjoy daily “jam sessions” with a professional producer. Compose and record your own hit songs with high-tech, multi-media technology using the Garage Band and MadPad apps on an iPad. For the grand finale, perform at the annual “ESF Music Awards”. Friends and family are invited to attend. Conquer a towering rockwall with challenges designed for each skill level, under the watchful eye of an experienced instructor. This journey will lead you down the road of self-discovery, as you participate in teambuilding initiatives, collaborative problem-solving activities and exercises designed to develop and enhance the leader in you! Mangia Italiano! Put on your apron, roll up your sleeves, and follow us into the kitchen for a week of mouthwatering fun. Guided by an executive chef, create and enjoy palate-pleasing dishes from various regions of Italy including homemade pasta and sauce, gelato, Pizzelles, cannolis and more. Learn about food preparation and kitchen safety, explore helpful hints for measuring, chopping, mixing, and garnishing, and much more. You’ve got your BIG idea, now it is time to communicate it to the world. In this exciting TLA, make the world say “WOW!” as you create a value proposition for a new product or service that sets you apart from others in the market place. Study some of the most popular advertising campaigns of all time and what made them successful. With your team, create a marketing plan, persuasive sales pitch and multimedia advertising campaign including print, web, social media, and/or TV to promote your product or service.